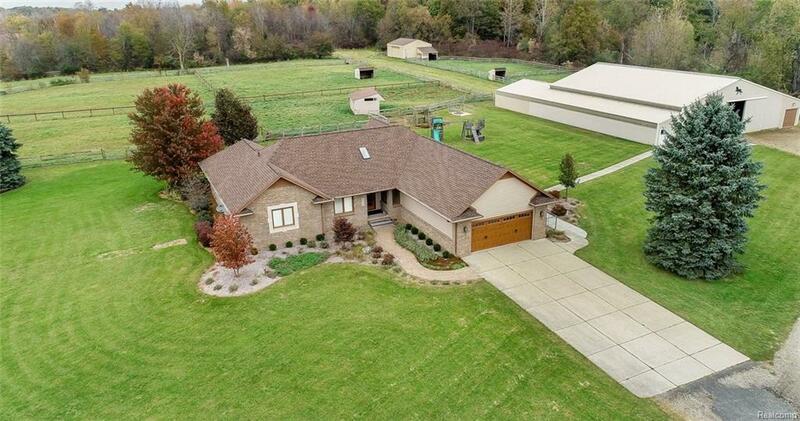 This 10 acre equestrian property stands out amongst the crowd! Ideally situated on the end of a paved cul de sac, this updated ranch home boasts 2,591 sq ft, 4 beds, 4 Â½ baths along with a huge finished basement. When you enter the home, you immediately notice the custom entryway and extensive woodwork in the study. The recently remodeled kitchen features an open concept layout w/ granite countertops, tiled backsplash, large island and eating area. The family room features a gas fireplace, vaulted ceilings and access to the patio. New Chelsea plank floors are featured throughout much of the main level. The master suite includes access to the patio, a large bathroom w/ steam shower and a 13x8 walk-in closet. Other rooms include a formal living room, jack and jill rooms, and a princess suite. Equestrians will appreciate the Wick building w/ 10 stalls, indoor arena, tack room and workshop. Other amenities include: outdoor arena, 7 pastures, 4 run-in sheds, outdoor wash rack and pole barn.